Beautiful bevels in Cinema 4D & Cineware. Infinite options. Take your 3D text to the next level with this all-in-one bevel toolkit. 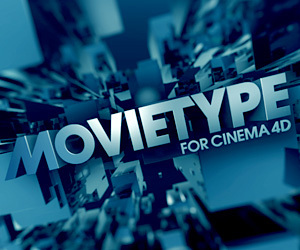 Text Edge Pro is a must have tool for anyone who works with 3D type or logos inside of Cinema 4D. This is a preset that creates brilliant looking text and logos super fast, perfect for broadcast, movie trailers, print, or any workflow that requires creating beautiful 3D text. With it you can add custom outer, inner bevels, and edges to any text that goes above and beyond the stock bevel options in C4D. The best part? It’s non-destructive! What does that mean? Develop your text bevel look and you easily edit it, change the font or text just like you would with the MoText object while keeping the bevel intact making iteration a breeze! Along with applying bevels on your type, you can also put bevels on any spline shape you bring in, whether it be a logo made in Adobe Illustrator or a spline shape made directly in Cinema 4D. Start by using any of over 50 bevel preset scene files that are included, or start from scratch creating your own bevel, texturing your text with over 50 materials, and light it using over 20 HDRI’s, Text Edge Pro has everything you need to create amazing 3D text! Text Edge Pro takes your text to a whole new level. It’s faster, includes over 15 new features, and now has Mograph and Dynamics support built in. 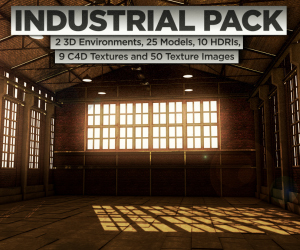 With it’s extremely intuitive controls, endless customizable options, and over 50 text bevel preset scene files, 50 materials, 20 HDRI files, 15 custom inner bevels, plus the ability to make & use your own custom bevel shapes, it’s essential for anyone who needs to make amazing looking text or logos inside of Cinema 4D or Cineware. 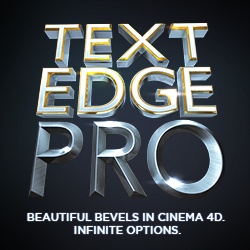 Text Edge Pro requires Cinema 4D R12 (Broadcast or Studio version) and above. Text Edge Pro is fully compatible with R13 (Broadcast or Studio version) and above including Cinema 4D Lite meaning you can create gorgeous text for use in Adobe After Effects CC. NOTE: Preset scene files require Broadcast or Studio version.